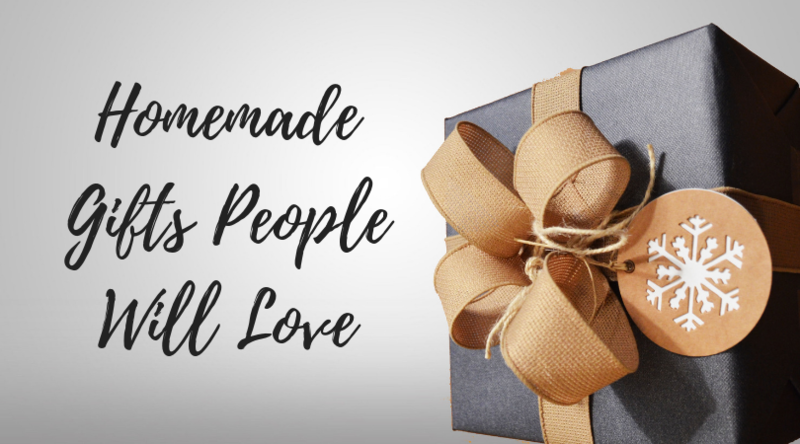 Over the years I have received all kinds of homemade gifts, and I really love the fact that people are willing to put their time into making me something. I have also given them and wondered if they are appreciated and used. In my opinion, it really is the thought that counts up to a point, but a gift should also be tailored to the recipient. With that in mind, I have compiled a dozen things that aren’t complicated, and I am sure will be happily received. A pretty tray or tin of cookies is always a great idea. If you don’t know the recipient very well you might want to skip nuts just in case of allergies. I love sugar cookies myself, and if you have kids it’s fun to decorate them together. This recipe doesn’t even require a rolling pin or cookie cutters! Do you have a killer chocolate chip cookie recipe? A fun way to gift them is to make the dough, shape & freeze the cookies, and present them in a foil pan with baking instructions. I Heart Naptime has a free printable label here, I love printable labels since my handwriting isn’t super pretty. Homemade jam or jelly is easy to make, for a change of pace, try hot pepper jelly. It makes a great appetizer on cream cheese with crackers or a glaze for broiled pork chops. Limoncello is the easiest homemade adult beverage I can think of, and it’s refreshing any time of year. This recipe gives tips to adjust the alcohol level and sweetness. Eggnog is my favorite holiday drink. Alton Brown shared a recipe for aged eggnog a few years ago, and it is amazingly flavorful and smooth. He says to age it a minimum of two weeks, so you’ll need to make it soon for Christmas. The recipe makes about 3 quarts so there is plenty to share. Coffee liqueur has so many ways to make it ranging from using vodka to rum to tequila. To keep the cost down, vanilla extract rather than vanilla beans is a good idea. I have this recipe aging in my kitchen right now, and a preliminary tasting says it’s great. Sugar scrubs are an easy way to pamper yourself, and so simple to make. Ikea has flip top jars in a 3-pack that would be perfect for gift-giving, or the 4-ounce jelly jars by Ball® would work. Rice bags are so easy to make and come in handy for multiple uses. Heated in the microwave they give a moist heat that is soothing for muscle aches. Small ones can be tucked in your pockets as hand warmers if you are going to be outside on a chilly day. And a larger one can be used as a bed warmer! What a fabulous idea, I hate getting into a cold bed in the winter. Whether you drink tea or coffee, keeping it hot and preventing it from burning your hand is a challenge. Here are 15 ideas for cup cozies of all different types. A sewing kit in a large mason jar is handy and a fun way to present a practical gift. Several small spools of basic thread colors, a set of needles, small scissors, and some standard buttons will fit nicely and save someone a lot of frustration. A spa kit in a jar would be great for a Secret Santa at work. You can include a bath bomb, a small scented candle, travel size luxury lotion, and a sheet mask for an evening of pampering. Or all the things for a pedicure at home would fit well in a jar. Last, but not least, would be a food kit of some type. Homemade hot chocolate mix, a cookie mix, a scone mix, or a flavored coffee kit all sound wonderful. Don’t forget that BillCutterz is always here to make sure you are getting the best possible rate on your bills. Take a few short minutes to sign up if you aren’t already a customer, or send us a current bill that needs renegotiating. Our team of Savings Experts will go to work making sure that you aren’t overpaying for your services.